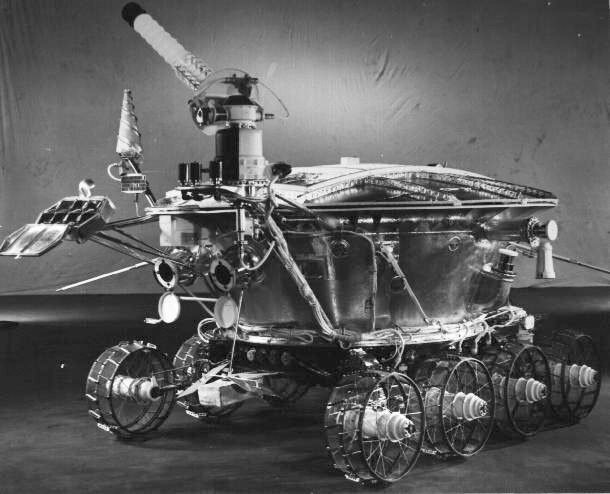 On November 17, 1970, the Soviet spacecraft Luna 17 delivered the lunar rover Lunokhod 1 onto the surface of the moon. For 11 months after, controlled in real-time by a human team in Moscow, it explored seven miles of the lunar surface. Sending back reams of data, it was considered to be one of the biggest successes of the little-known Soviet lunar exploration program. And then, it disappeared. It wasn’t abducted or anything, it just ceased transmitting, as space probes have a tendency to do. This spring, NASA’s Lunar Reconnaissance Orbiter spied it on the moon’s surface. The really neat thing: it can still reflect laser beams back to Earth as if it were brand new. NASA has previously attempted to locate Lunokhod 1, but it wasn’t until this recent sighting that they were able to pinpoint its coordinates. Once its location was established, pulses of laser light were sent to it from the 3.5 meter telescope at the Apache Point Observatory in New Mexico. Amazingly, the rover’s retroreflector sent the pulses back to the observatory bright and clear. It isn’t known why Lunokhod 1’s reflection is so much better, but NASA believes it could yield clues as to why other reflectors placed on the moon have weakened after a decade spent on the lunar surface. Now that it has been located, Lunokhod 1 will become part of an ongoing laser ranging study. By measuring the time it takes for laser pulses to reach various locations on the moon and reflect back, over time scientists can map its orbit with millimeter precision.